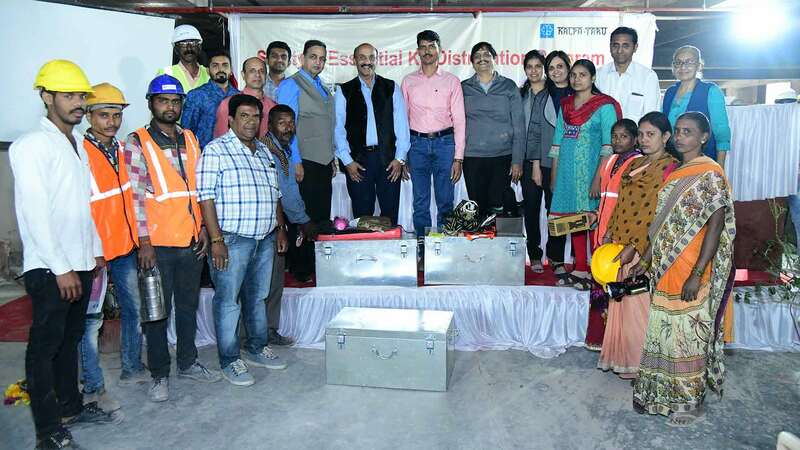 Mr.M.A.Mujawar, Labour Officer, Labour Dept, J.P. Shroff, Chairman, Labour Welfare Committee of CREDAI- Pune Metro, Mr. Milind Talathi, Mr. Yash Bhandari, Mr. Yogesh Bhongale, Mr. Mukesh Gada, Mrs.Sapna Rathi, Mrs. Archana Badera all Labour Welfare Committee Members, Dr. D.K. 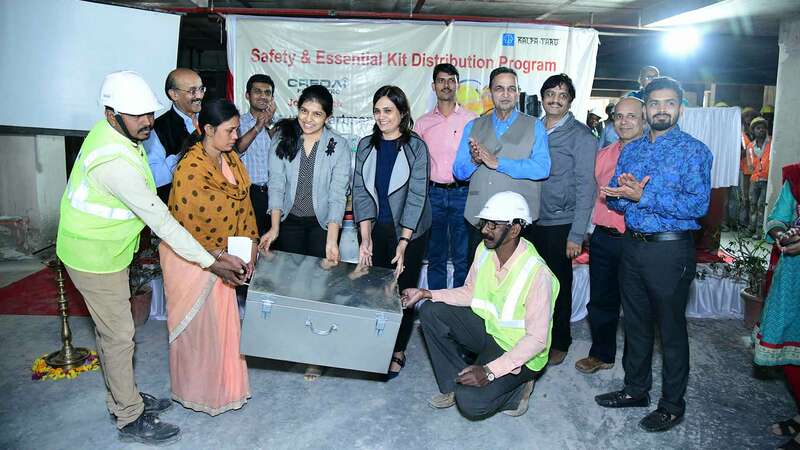 Abhyankar, Director General, Urmila Jhulka, General Manager, Samir Parkhi, Labour Welfare Officer from CREDAI-Pune Metro, Cdr.Rupak Berry, CEO Kushal, Sanjay Chavan, Admin.Officer of Kalpataru Group graced the event with their presence. Dr.Abhyankar, in the opening remarks welcomed all explained the CREDAI- Pune Metro Initiatives reg. Labour Welfare Activities for construction workers and BOCW with special mention to Safety and Essential kit. 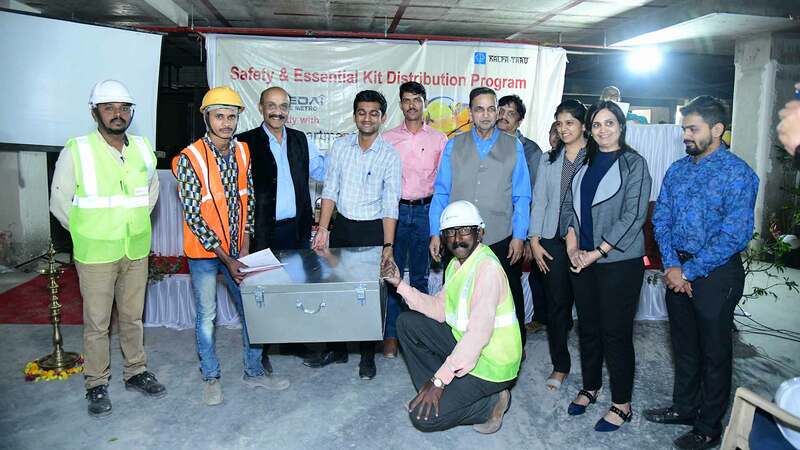 J.P.Shroff, Chairman Kushal and Labour Welfare Committee explained the importance of Safety and Essential Kit to registered labourers and items mentioned in it. He further mentioned that it is very essential to get workers registered under BOCW to get the various benefits of BOCW Board. On narrating the benefits of getting registered in BOCW Mujawar said, each labour can avail the various benefits like Educational, Marriage, Medical, Financial, Social Security, post death etc. Safety and Essential Kit is one of the benefits. Every construction labour must use the items given in the Safety and Essential kit. He has appreciated the initiative taken by Kalpataru Group and CREDAI-Pune Metro. Kalpataru Group is always active in registering the labours and previous camps including awareness program has also been conducted on Baner Site. He has declared that the Kit distribution program has been started in Pune and many more construction sites will be covered lateron. 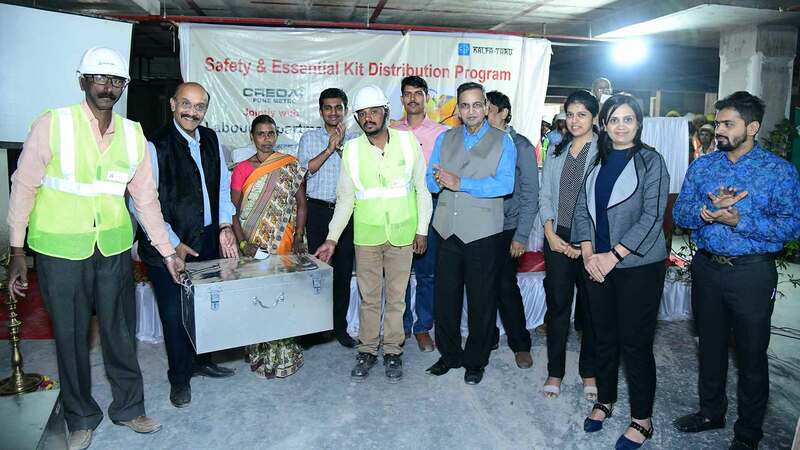 Mr. Sanjay Chavan,Admin Officer expressed thanks to Labour Department and CREDAI-Pune Metro for strong co-ordination and followup and assured that each and every labour now will be registered under BOCW and this distribution program will be continued on each site of Kalpataru Group. Mrs. Arachana Badera, Labour Welfare Committee Member proposed vote of thanks to Labour Dept, Kalapataru whole Team, CREDAI-Pune Metro and present workers. The anchoring of whole Program was done by Ms.U.K.Julka, General Manager, CREDAI-Pune Metro.